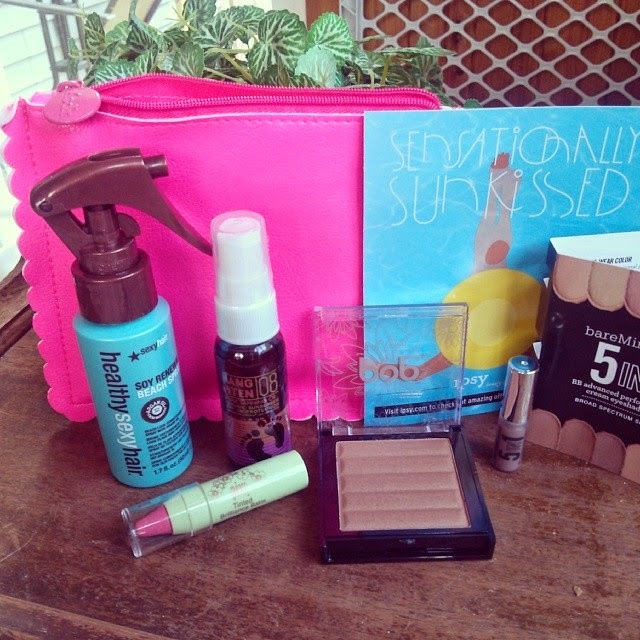 I just received my 2nd Ipsy Glam Bag - the July Sensationally Sunkissed bag. I've tried other monthly box brands but never liked any as much as Ipsy. It's fun to get new products that are picked out specifically for me in a stylish makeup bag. Everything in this bag was very low-maintenance and perfect for summer. The 5-in-1 cream eyeshadow was a small sample but it didn't take more than a dab to cover my lids and it stayed on all day long through sweat and swimming. It's a great way to still look polished during outdoor activities. My favorite item is the full-size bronzer. It gives me a healthy glow with just a bit of sparkle. I also really like the beach spray since it gives my hair texture and more fullness. The Pixi Beauty balm is really cool too - it goes on as a colored balm, then works with your pH to stain your lips with long-lasting color once the balm wears off. The shade is a darker pink than I usually use, but it's fun to have something different and bright for summer. Want to try Ipsy for yourself? You can sign up with my invitation link: http://www.ipsy.com/r/b699 It's only $10 a month and you can cancel easily (online) at anytime. Totally worth it!